Items Bought - is there a way to view older items? I was trying to track down what I paid for a couple of items I've bought on BoB, as a rough value for insurance purposes, and I can only see items going back a year. Is there a way to see items bought or auctions won going back beyond a year? After you have clicked on "All items bought or won" you can adjust the date rage to any date you want. I tested it below by adjusting the date range to show all purchases from 5 August 2010 to 5 August 2011. You need to adjust the end date as well. In other words, set the FROM date to 5 August 2012 and the TO date to 5 August 2013. 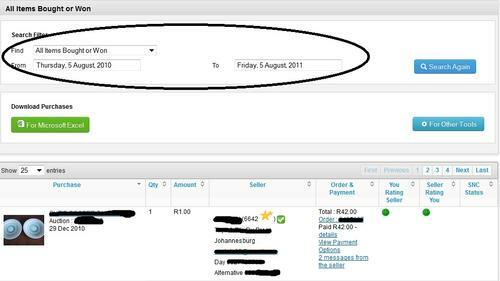 After that if you want to search for purchases from the previous 12 months you will set the FROM date to 5 August 2011 and the TO date to 5 August 2012. Ah! Thanks for that explanation.